Nice home in a quiet neighborhood with a convenient location to everything.Our large 4br/2.5ba home is the perfect home base for your Auburn weekend. Our 2,700sf home is on a street with a cul de sac, front and back yards, and plenty of parking space. Located just 4 miles from Jordan-Hare Stadium, this home is perfectly located for anyone looking to make the most of their weekend in Auburn. We have hosted many football fans, and no guest has left unsatisfied. Built in 2006, this home boasts 4 bedrooms and 2.5 baths. 3 bedrooms and 1 bath are upstairs and 1 bedroom and bath is downstairs. The master bedroom has 1 queen Sleep Number bed . Relax and watch tv in the large living room. Full dining room table with 10 chairs. Laundry room with washer and dryer. Patio for relaxing and grilling. Plenty of room for entertaining any guests you may want to invite over while in town. There is a 2 car garage & plenty of off street and on street parking. Once you park for the weekend you will be able to walk everywhere and avoid gameday traffic. Fully stocked with linens and stainless steel kitchen appliances and utensils. The STADIUM is only 4 miles away. There is a GOLF less than 5 minutes away. -Kitchen is open to the den, and has a breakfast nook attached breakfast area connecting to the living room. -Also has a dining room. -Internet and DirectTV with premium channels (ESPN anyone!) is provided. Our family has been enjoying this retreat for seven years. The owner has 20 years experience with this type of property and knows what amenities guest expect. Auburn is a great town and our location is 15 minutes from anywhere, from Tiger Town, downtown Auburn or the AU Stadium. This property sits in a nice neighborhood just moments away from downtown Auburn. If you are interested in visiting Lake Martin, this property sits only 20-25 minutes from the lake! There are hundreds of events each year at Auburn University and the City of Auburn. We had a wonderful experience at this lovely home. Very spacious property that made everyone in our party feel at home and very comfortable. 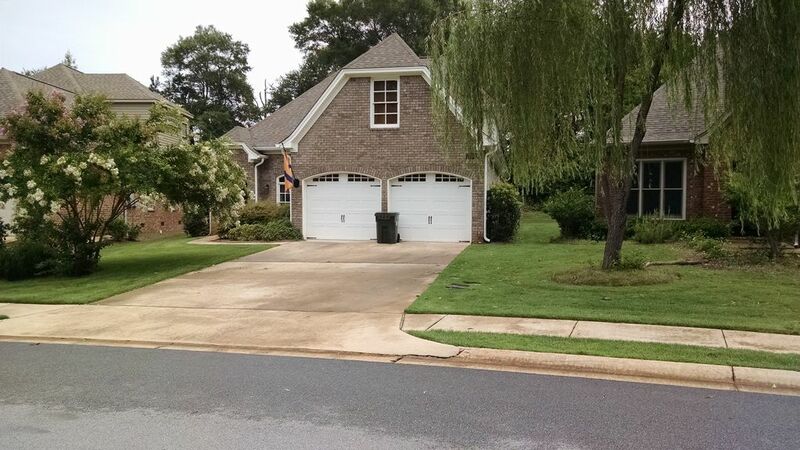 Quiet neighborhood with short drive to anything Auburn! The home was everything I expected and more. Conveniently located to the Auburn campus in an upscale neighborhood. I would certainly rent this house again! Great house!! Just what we were looking for. Loved it! Select comfort bed, huge master bathroom, plenty of seating, stemware, quiet neighborhood, clean and new, groceries less than 3 miles away, TVs in every bedroom. We had an excellent week relaxing with family. Very spacious and convenient to all of Auburn! My family and I needed a house to stay in for 2 weeks while we were having repairs done to our home! Mr. Hammonds answered our request almost immediately and was very easy to work with! This home was well cared for, very clean and in a nice neighborhood! The bedrooms are large and the house is very comfortable! We were very fortunate to have found this rental and would recommend this rental to anyone needing a home away from home!! We had a great time and the house was everything is said it would be. Enough room for everyone to enjoy them selves without being in each other way. The master bed with the sleep number bed was great, since I had emergency surgery that week and needed to rest. Only thing they were missing is a toaster in the kitchen. Great place and location . Auburn University hosts a variety of events throughout the year including, but not limited to: all collegiate sporting events, a variety of tournaments[ including Golf ], music, concerts, musical theater, a thriving social scene with bars and restaurants, access to outdoor activities, TigerTown, Downtown Auburn, and is not far from Lake Martin, I-85 access to Atlanta, KIA Motors, Montgomery, and shopping.